You’re not alone in your struggles. In fact, companies the world over experience the same predicament: trying to repeatedly and successfully convey how their products or services can benefit consumers. But, believe it or not, uniting the forces of education and marketing can go a long way in your pursuit of happiness. Don’t just market to your customers, though. Instead, find new and innovative ways to educate them about why your offerings can solve a need in their household or simply provide some form of comfort and satisfaction. Here are a few takeaways from some of the more successful companies already putting this to practice and how you can apply it to your own business. Still on the fence about blogging? For most companies, it takes quite a bit more than advertising to get customers through the proverbial doors of their e-commerce business. In fact, before consumers invest their time and money into a particular product or service, they want to ensure they’re receiving some sort of value and they usually rely on some type of content marketing to inform those decisions. According to a recent HubSpot survey, 47 percent of consumers said they digest three to five pieces of content before making a buying decision. Moreover, potential buyers are on the lookout for informative blog posts, as these resources tend to be trusted, information-rich sources of content, which can include anything from problem-solving tips to how-tos. Take a lesson out of the Tirebuyer playbook. The online retailer publishes blog content regularly, including posts about tire rotation frequency and the crucial features motorists should consider when buying new tires. Of course, blog posts should also include and provide sales opportunities. At the end of each blog post, look for ways to include backlinks to specific sales pages in order to create a more seamless buying experience. It’s hard to compete in business without the ability to always have face-to-face customers interactions. But in today’s digitally-driven age, consumers are looking for new ways to connect with and learn from brands in real time and many are turning to webinars. For example, the Digital Training Institute provides those eager to learn with free content covering a range of digital-related content, from social media to digital citizenship. During these webinars, attendees also have the opportunity to ask questions of company leaders through live chat. Take a note from the Digital Training Institute and consider hosting your own free webinar. Indeed, you can use this time to discuss important industry trends, or simply provide a forum for customers and clients to ask questions. From there, you’ll want to add the webinar recording to your website, allowing visitors to watch this content on demand. But don’t forget to post the link to social media, as this will not only allow you to reach more people but also help you promote your next webinar and overall business venture. 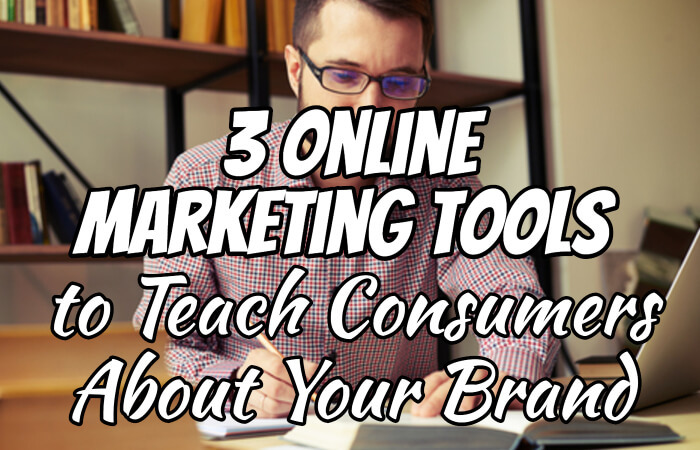 You know all those emails you receive every day from some of your favorite brands? Well, there’s a purpose behind this form of constant messaging: customer retention. However, despite the success that many companies realize from this initiative, email marketing is a powerful educational tool that’s underutilized. According to the Direct Marketing Association, companies that use email marketing to their advantage can see their ROI reach a whopping 3,800 percent. This figure alone should be reason enough to implement an email marketing strategy for your company. In fact, think of email marketing as content marketing’s best friend. Moreover, email marketing gives your brand the chance to stay in touch with customers and provide them with valuable information. This practice can also serve as a call to action and boost morale. For example, donors who give to Charity Water, a nonprofit that provides clean and safe drinking water to people in developing nations, receive emails that detail how their contributions are being used to benefit those in need. Of course, these and other forms of messaging can be carried out in your own email marketing strategy and tailored to your intended audience. Indeed, showing consumers how your company operates can go a long way in winning them over. The late Nelson Mandela once said, “Education is the most powerful weapon to change the world.” And it seems more companies can take this message to heart. Ultimately, your brand needs to become a storyteller of sorts, one that’s able to equally inspire and inform; after all, customers only truly care about themselves but they want to do business with brands that can continuously meet their needs and interests. So don’t just market to your customers, educate them.